The trails call to them. And two local women answer that call in a big way, while also encouraging other females to literally follow in their footsteps. 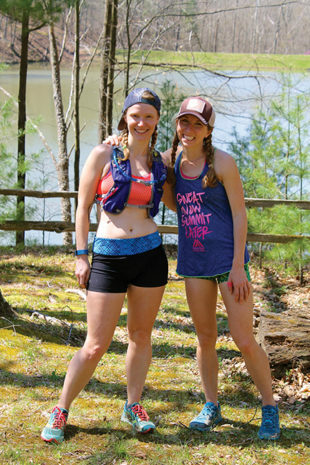 Once a month, Alicia Rich and Miranda Addonizio usher a group of women — some novices to trail running — through the trails of Yellowwood and Morgan-Monroe State Forests, Brown County State Park, and other area trails. They call themselves the Indiana Female Fellraisers, a group Rich initiated last October on Facebook. The positive response amazed them — 100 women signed on within two days. Since November, up to 30 women have been coming out for the four- to 20-mile runs. That’s something both she and ultra-runner Addonizio, 34, want to change. “You never hear or read about their amazing feats,” says Addonizio, a copy editor who ran the Indiana Trail 100, her first 100-mile race, in April at Chain O’ Lakes State Park in Albion, Indiana. The Indiana Female Fellraisers hope to change that by increasing women’s interest in trail running and giving them support and opportunities to run on trails and compete in races. They say it’s important, too, that the group provides camaraderie and social time. All women, regardless of speed or trail running experience, are welcome, says Rich, who has won several ultra-races and is training for the Eastern States 100 competition in August. On runs, she and Addonizio make sure no one gets far behind, despite the fact that runners’ ages range from the teens into the 60s. Any woman can join the Facebook group and get information on runs.